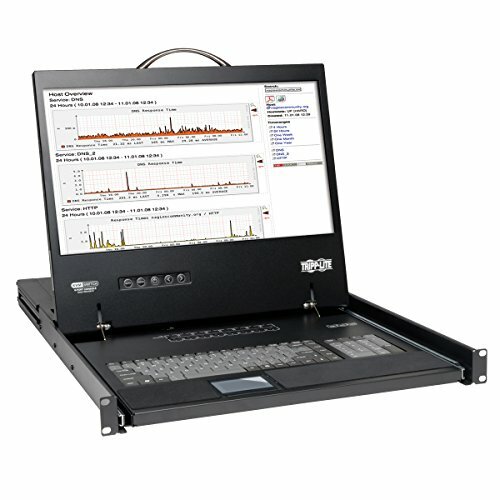 Tripp Lite's B040 Series NetController Rackmount Console KVM switches are a cost effective and highly flexible system for controlling up to 128 computers from a single 19" display console. Available in 8port or 16port, these consoles can be daisy chained with Tripp Lites stand-alone B042 NetController series KVM switches via dedicated daisy-chain ports. Switching between attached servers can be accomplished with on console push buttons, On Screen Display menu, or Hot-Key.Utilizing Tripp Lites P780 series super slim KVM cables ( not much thicker than a standard Cat5 patch Cable ordered seperately), KVM cabling is kept to a minimum and extremely manageable. Cables are double duty, attaching to either PS/2 or USB based computers, without purchasing additional adapters. An additional USB port is provided, allowing attachment of an external mouse to be used in lieu of the provided console touch-pad.The B040 Console KVM switches support a wide variety of software platforms, including: MAC, DOS, Windows 95/98/SE/NT/2000/ME/XP/Server2003/Vista, Linux, Unix, and BSD. Password feature provides additional security to prevent unauthorized access to attached computers. All hardware included for 4-post racking, and designed for easy, one person installation.